Last time we wrote about Rinspeed it was to talk about their dual power-capable E2 concept vehicle, and the gorgeous iChange. Now the company’s revealing its UC? (Urban Commuter) concept that marries electric cars and public transport in an effort to save the environment. The UC? 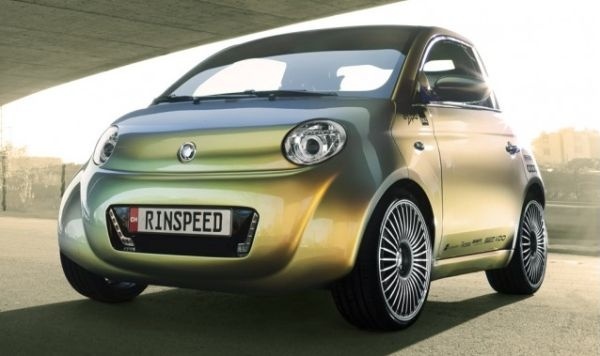 is due to get a public outing at the Geneva Motor Show in March, where you’ll actually be able to see it in action, but Rinspeed’s revealing the concept now, probably to stir up a public debate about the unusual mixed-mode transport idea at its core. this solves the problem of the limited long-range capabilities of all-electric vehicles, enables more practical and comfortable long-distance travel in the bigger spaces of a railway car and un-clogs the roads. The super-lightweight car itself is a short 2.6 meters long, in the mode of a Smart (at 2.5 meters) and with roughly the same intention: Acting as a small, convenient vehicle for the city commuter that’ll be easy to thread among the traffic and park. The working concept car has a top speed of 120 km/h (typical European freeway speed) and can venture up to 105kms on a single charge. As the press release notes there’s also one more surprising feature of the UC?–as well as being a proof-of-concept demonstration vehicle, it’s also designed to be ready to roll into mass production. Would it succeed if it did go on sale, joining the ranks of the Teslas, Apteras and other eco-vehicles out there? That’s tricky. The car itself seems ideal for local commuting jaunts, zipping to and from work and being topped up with an overnight charge. The integrated train system is a more difficult idea to see working. It might succeed on long trans-continental journeys across the U.S., or longer trips across the E.U. and the concept of drive-on trains already works well for the Eurostar trains that zip beneath the English Channel, meaning it’s already a proven tech. But the hardest part would be to capture the public’s imagination.